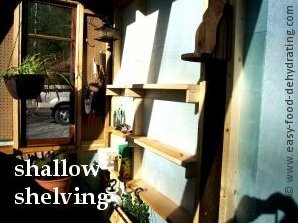 This recycled greenhouse is situated below their home's upper deck – what a clever way Bev and her husband made of this otherwise under-utilized space! 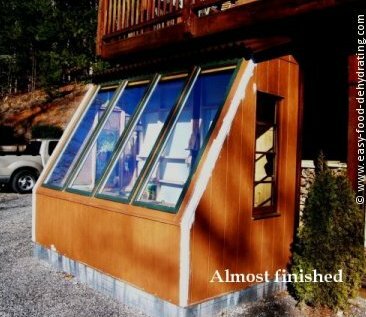 Bev started building it last Oct (2011) and it took around two months, but she says "more like a month really, as we had time out due to sickness and a trip." Bev says: "Here is my recycled greenhouse/potting shed. 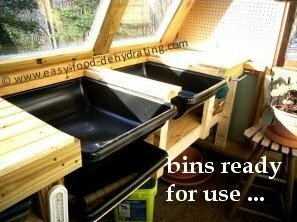 I built four bins, two on top, and two underneath, for potting mixtures. The two top ones have removable covers, so in the winter I can just plant lettuce and spinach right in them! All the counters are slatted boards. I did start some broccoli and cabbage and a few are starting to come up in pots. Can't wait to get them outside so they can get some real sun! I've just stained the counters and need to apply spa varnish before I start to work out there. Onions will be next! I do those by seed so I need to start them early ... I did them in the spring last year so they are still out in the garden growing!" Measure Twice, Cut Three Times! The greenhouse was built around the recycled windows – but the rest of the stuff was from Lowe's. The siding is called LP SmartSide Paneling – pressed-wood pieces on one side, and molded to look like paneling on the other side. The panels come pre-primed and ready to paint! Bev put up pegboard on the walls, very handy for hanging tools. I asked Bev what she will grow in her recycled greenhouse? She told me "I have all my seedlings here; tomatoes, peppers, squash of all kinds; herbs and some flowers – and eggplant! I had my broccoli, cabbage, and Swiss chard started in there, but they are now outside." It's vitally important to know what you're doing. To that end, Bev decided that she would take classes and obtain her Master Gardener certification. The course started February 2nd, and finished on April 19th – and Bev's now a proud Master Gardener! I asked Bev what's the best thing she learned from the Master Gardener classes? Her response: "We had some great hands-on classes about pruning fruit trees and smaller fruits like grapes, blueberries, and raspberries, and Companion Planting or Farm Scaping which means planting certain veg and/or flowers next to certain vegetables to repel or attract good bugs and bad bugs ... as well as rotating your veggies with plants that are not within the same family. Kind of an organic type of pest control." I posed this question to Bev next: Will you use the Master Gardener Certification for your own use, or do you think you'll utilize it in another capacity? 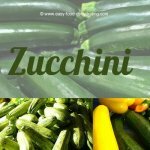 Bev: "Mostly for my own use but I am also helping start a community garden for some folks I know and plan to do some volunteer work for Jackson and Swain County (in North Carolina). We need to continue to put in 20- to 40-hours a year of training and volunteer work to keep our certification." What A Great Recycled Greenhouse! To be honest, I've never met such a hard-working lady – not only does Bev do all this but she's a top-notch Realtor too! 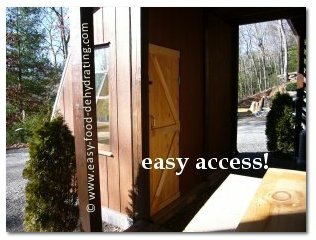 (I need to remind you that if you're so inclined to be looking for private get-aways, close to streams etc, Bev has a couple of fantastic listings ... click here to go to Bev's site).